2. Cover the middle of the tortilla with sliced strawberries. Be sure to bypass those beautiful but often tasteless supermarket berries and hit the farmers' market or a friend's garden instead—sadly, strawberries always rank near the top of the Environmental Working Group's Dirty Dozen List of the most contaminated produce. An afternoon at a U-pick berry farm makes a great family outing or fun foodie date; find one near you at PickYourOwn.org. 3. 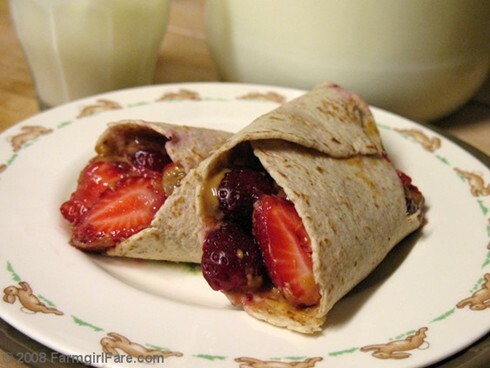 Roll the tortilla up as best you can, gobbling up any overflowing berries. Slice in half if desired. Set on a favorite plate, preferably one that makes you smile, perhaps because it's covered with bunnies. 4. Enjoy with a very cold glass of milk, straight from a Jersey cow down the road if at all possible. 5. Substitute fresh raspberries, blueberries, or blackberries if your strawberry season is sadly already over. 6. Makes a great snack, too. © Copyright 2010 FarmgirlFare.com, the not always so virtuous when it comes to breakfast foodie farm blog (because sometimes you just gotta eat dessert first thing in the morning) where you may have noticed that this picture is marked 2008. I'm making a pathetic stab at better organizing my zillions of unorganized photo files, though I still haven't found the original of this one which is why I didn't remove the date. Who knew I had so many forgotten food photos? Mmmmmm! I am trying this! Mmmm....I need some berries. That's what I want to have for breakfast tomorrow! We had these this morning, adding a dash of cinnamon -- so good! Thanks! I do believe this might be on the breakfast menu this morning. :) thanks for the idea! Isn't it sad that strawberry season is so short? The Michigan berries we bought at the farmer's market were delicious! The grower told us we might get one more week - I'm hoping so!!! Well I never thought about PB and strawberries together before but I guess it's like a PBJ sandwich - only nicer and more grown-up (not counting the cute plate!) I'm going to try it as I just visited our local PYO. Yep - sold. Had this for breakfast this morning with strawberries picked from the garden and whole wheat bread I baked a few days ago. You have a Bunnykins plate! What kind of tortillas do you use? I'm never satisfied with my grocery store tortillas. Ever make your own? I shouldnt read your blog on an empty stomach - now i feel so hungry! I cant wait to try these tomorrow morning! I do this with bananas, and sometimes toast the rolled up "burrito" in the oven for a few minutes. I'm definitely going to try it with some berries the next time!